The ability to keep your motorcycle upright at parking lot speeds won’t necessarily save your life, it may save you from a broken foot (happened to me) and expensive damage. Sure, you can try to balance your bike using your legs, but it’s way better for your confidence and street cred if you rely more on proficient slow-speed maneuvering skill. Dragging feet is for losers. As speeds decrease, we lose the benefit of inertia and gyroscopic forces. The slower you go, the greater role you play in keeping gravity from pulling your motorcycle onto its side. This means keeping the Center of Gravity located directly above the tire contact patches (or keep the contact patches directly beneath the Center of Gravity). To do this, you must constantly adjust the Center of Gravity / contact patch relationship. It’s like trying to balance a broomstick on your palm. It takes continual adjustment to keep the broom’s contact point vertically below the Center of Gravity so the broomstick remains upright— react too slowly and the broomstick falls to the floor. You must do the same thing when trying to stay upright on a slow moving motorcycle. The difference is that the motorcycle is the “broomstick” and you must move the tire’s contact patch to keep in balance. 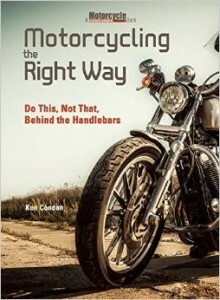 This can be done by turning the handlebars left and right, causing the steering head– and the motorcycle’s Center of Gravity – to shift from side-to-side. Shifting body weight can help maintain balance. By shifting your bodyweight, you move the combined Center of Gravity of bike and rider over the contact patches. A limber torso and a loose grip on the handlebars helps maintain balance in this way. When making tight turns, position your weight on the outside footpeg (the right peg for left turns) to let the motorcycle lean. Keep weight on your footpegs so you can lean the bike more-or-less independently of your body (and vice versa). This allows you to quickly shift body weight, turn the handlebars, or lean the bike to regain balance. We tend to go where we look and where you want to go. When performing a tight U-turn that is 180 degrees behind you. Turn your head over your shoulder to look at the turn “exit”. One other reason for keeping your feet on the footpegs is so your right foot can apply rear brake pressure if you need to slow. The rear brake is also useful for increasing stability. Maintain steady drive while you drag the rear brake to control speed and also give the drivetrain a force to “pull against”. This “tension” steadies drive force and helps pivot the bike around when making tight U-turns. One of the most critical controls to master when performing U-turns is throttle control. Forward drive must be delivered smoothly, otherwise you risk dropping your motorcycle. It’s really difficult to make a tight U-turn with the motorcycle lurching abruptly from ham-fisted on-and-off application of the throttle. Roll on the throttle enough to not stall and keep the throttle steady. Ease out the clutch about halfway, using the “friction zone” for speed control. Drag the rear brake lightly to refine speed control. 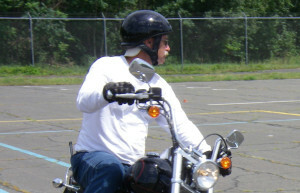 Turn your head, turn the handlebars, lean the bike, slip the clutch, drag the rear brake, and control the throttle. That’s not too much to do, right? You may have to lean quite a bit, but that’s okay as long as you maintain steady drive. Minimize throttle movement by keeping your wrist down and anchoring your thumb or index finger to your handlebar control pod. When you can, try to do your tight U-Turns from a rolling start. That way you have stability already under control. You can also utilize the “keyhole” technique of rolling forward and then swerving slightly away from the direction you want to go before making the turn. this gets the bike leaned earlier. This is a bit tougher. To make a tight turn from a stop, you will want to pre-position yourself and your bike before moving forward. This is done by turning the handlebars to almost full-lock while leaning the bike as far as you feel comfortable into the turn. Your right foot should be on the rear brake with your left leg supporting the bike. Turn your head over your shoulder to look at the turn “exit”. Now, give it a bit of gas while easing out the clutch quickly enough to go from zero stability (standstill) to stable (about 3-5 mph) in as short a time and distance as possible. But, don’t rush. While doing this, maintain the laen angle and handlebar turn. Get it right and the bike hioooks around gracefully. Remember, if you start to fall over, just ease off the rear brake or ease out the clutch a bit to get your speed up a little. But, not too much or you’ll run wide. Slow speed handling doesn’t have to cause anxiety. A bit of knowledge and practice can increase confidence and decrease the likelihood of a slow speed tip-over and possible injury. Tell me your experiences with slow speed successes and snafus. Its true you can’t move your bike with ease if you are dragging your feet. 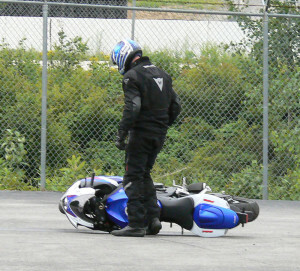 There is a risk of dropping a motorcycle if it is not well maintained. That video of the Ft Lauderdale H-D Drill Team is no longer available. Thank you. It is removed. I haven’t been ridding long. I had to have a Harley to start with. Doing really well except for slow speed turning and parking. I want to be able to do a 20ft turn from a stop. I practice about every day. Just can’t get my confidence up enough to power my way around that turn. This helped me understand where I went wrong on Day 1. Thanks for clarifying! Riding slow doesn’t sound very exciting but here is an example I find oddly inspirational. 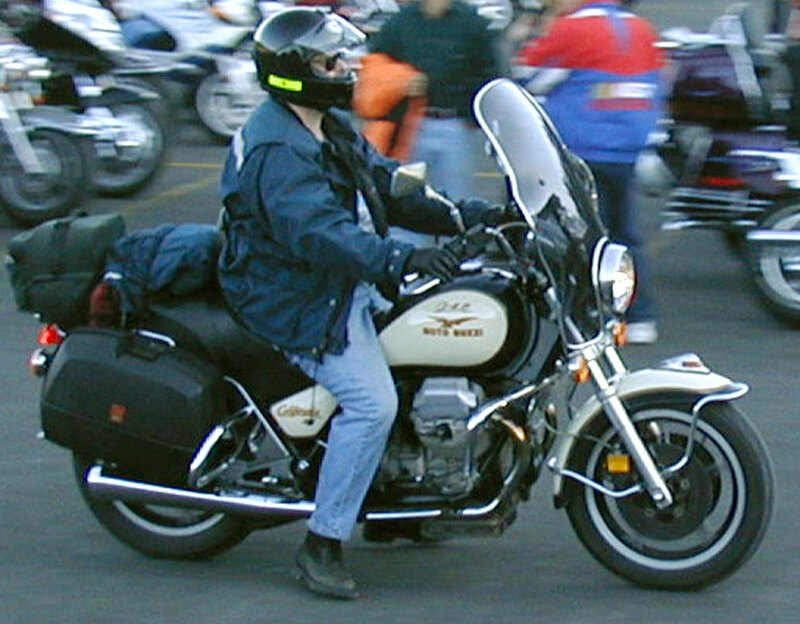 A police Harley is parked about two feet in front of a brick wall (facing the wall). The assignment is to drive it out of there. If I have the distance right, you can’t push the bike forward and not hit the wall because the bike must lean to turn that short and the bike is too heavy to hold up at the necessary angle. A skilled rider using the techniques Ken suggests can ride it out by counter balancing the leaning bike with his body weight. That’s magic of physics that always gets me hooked. Training with Ken really helped build my confidence in slow-speed manuevering. He showed me a few tips to bring my game up, and shooting for full-lock turns has become a twice daily practice routine for me in the parking lot at work. Going slow changes the dynamics of the bike, as the article indicates. I find that keeping the bike bolt upright and the body balanced over it and then turning the handle bars puts the bike around without falling over, or the need to put your feet down, training wheel style. I know nothing of motor officer training, so can’t comment on it, but I am impressed with the motor officer who put his patrol bike through the close order drill of all those orange cones set up in tight radius turns. I practice this style of slow turns because of experience in Rolling Thunder. The corner where the Marine stands and salutes is one of the most dangerous parts of that ride. The DC Fire/EMS stations an ambulance there because of it. At that corner , in the middle of leaning to take a curve at slow speeds, when traffic stops in front of you and you cram on the brakes to stop, you will fall over. That’s how you break your foot, especially if you are not wearing steel shank boots. Ugh such and important topic. Like Kurtz said I watch guys go balls out then when the stop for lunch they can barely do a U turn. Clutch control, clutch control, clutch control. Do I sound like an MSF coach yet? Throttle control is awesome but I’ve yet to meet anyone that can effectively and smoothly control a bike’s speed during parking lot maneuvers using only the throttle. 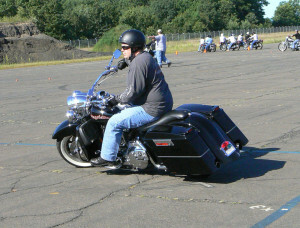 Most bikes are far too twitchy moving from idle to just barely opened throttle. The point about maintaining some throttle and using the rear brake works but equally effective is maintaining steady throttle and modulating clutch slip to control speed. I find that it’s better to focus on “drive control” rather than just clutch control. The result is the same but it’s a combination of clutch and throttle that results in steady drive and this description seems to make it likely for the student to succeed. As a fellow Rider Coach I’ve been pretty good at low speed control, but I never really mixed in the rear brake until the start of last year. I simply planned ahead and slipped the clutch a lot. Mixing in the rear brake as a constant drag really brought up my game a lot. The tension of the motor/brake takes up all the slack in the driveline. I was surprised when competing in the Motogiro USA that many very experienced riders, many ex racers and vintage racers, have very poor low speed control. This is an area where new riders can excel even experienced riders with a little practice. Awesome post Ken. Slow speed maneuvering is probably the most under practiced skill for myself and lots of other sportbike riders. I can’t count how many times I’ve been out on a group ride with some really quick riders, only to see everyone(myself included!) look like it was our first time on a motorcycle when it came time to slowly navigate a parking lot when stopping for lunch. I am a member of Chester’s Ft. Lauderdale Harley-Davidson Drill Team. The video I posted was from a performance we did at the 2013 Florida State HOG Rally last month. No riders in the video are motormen police officers. We are just civilians who love to ride and we practice as a team twice a week, all year round. I bought Riding in the Zone and it certainly helped me a lot! Gene, I hope you don’t mind me embedding the video in the post…very impressive. Not at all Ken. I hope others will enjoy it. We all are riding Harley-Davidson Ultra Classics or Ultra Limiteds. 1 Pings/Trackbacks for "How to Ride a Motorcycle Slowly"